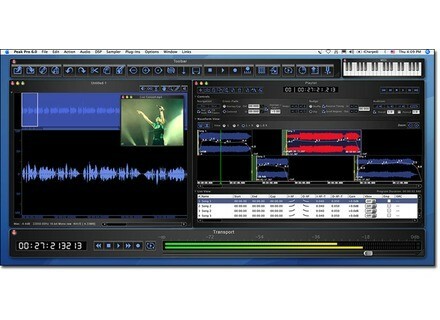 Peak Pro 6, Digital Audio Editor from BIAS. Of the three versions, LE, Pro, and Pro XT 6, it's the latter that was installed and tested. With Pro XT 6, BIAS has consolidated its editor, SoundSoap 2 and SoundSoap Pro cleaning software, version 1.2 of its Master Perfection Suite (which explains the price difference between the Pro version at $599 MSRP and the Pro XT at $1199 MSRP), and the Peak Production Pack. This pack includes a library of sounds (a little over 1 GB) by Sound Ideas, Shortwave, Serafine Sound FX, PowerFX, and Hollywood Edge, plus a $100 Broadjam coupon, a limited version of ONE sample player, the SFX Machine LT multi-effects (light version), 32 VST MDA plugins, Reveal LE and SoundSoap LE (identical to the full versions, but that only work within Peak), JackOSX (0.74), Soundflower (1.2.1) and WireTapPro (1.3.4). Take a look at the comparisons between the three versions here. The software has to be authorized via the internet by entering the serial numbers into the BIAS Authorization Manager. Once that is done, it will be immediately validated. You can authorize two computers, and the BIAS Key is no longer necessary (you regain a USB port ...). At startup, there's a surprise: the GUI has been redesigned. From the dominance of gray in version 5 we go to a dark gray-black look (by default, which be can changed), and buttons now feature a simulated backlighting which highlights an icon when the mouse pointer is rolled over it. The windows are "magnetized" with a default position that can be recalled. Peak 6.0.3 is compatible with OS 10.4.3 to 10.5.x, and can run on a G4 500 as well as a MacIntel. But performance will obviously not be the same ... To get the most out of Peak and all its features, it’s advisable to have a CoreAudio compatible sound card and a MIDI interface This software is quite comprehensive, from editing to RedBook burning, through all the intermediate steps, without forgetting video editing, sound design, or the use of virtual instruments. Since everything can't be detailed here, we’ll be just dealing with the new features. A file is shown between the Toolbar with its icons (on top) and the transport bar (below) with its traditional buttons (Play, Stop, Forward, etc..), time display, a general volume slider and customizable meters (they can calibrated according to several modes) and which become a progress bar during treatment. One new feature: Pre-Post buttons, which can reflect, or not, the changes made by the volume slider. There is still a multiple file display, either cascade (one over the other, slightly spread out) or side by side (the size adapts to the screen and the number of files). Users with a lot of Ram will be happy, BIAS has finally included RAM cache, which allows extremely fast editing. History is infinite in theory, so you can make several changes and still get a rapid return to the level of Undo and Redo desired. This requires more than 2 GB of RAM, and you must enable caching in the options menu. When saving, the cache is emptied, and all the necessary elements written onto the destination disk. I hope that this feature will be extended to include 24 and 32 bit files, because for the moment it only works with16-bit files. Because it’s an option, the Scratch Disks principle (on which temp edition files are written ) is still available, these drives have to be designated in Preferences. You can choose a folder, so as to avoid finding temporary files anywhere and everywhere. Another valuable feature is the ability to choose network disks, which is a plus in terms of storage and stability. DSP functions can be organized by type in the menu. That’s a plus, even if Peak’s dual approach with the Toolbar and conceptual menu (right-click) lets you avoid using menus most of the time. Peak has many tools for creating loops, including Loop Surfer and the effective Loop Tuner with horizontal and vertical zooming, that let you work on the loop without clicking within the loop itself. There’s also magnetism on zero point markers, regions, and loop points, so there’s no reason for your loops not to sound the way they should. Perpetual Looper is also added to the arsenal. It’s designed to easily loop monophonic audio files using new technology from BIAS (PHAT for Partial Harmonic Audio Technology), emphasizing the frequency domain rather than the temporal. Two types of settings are available: those devoted to analysis (determining the frequency range of the basic file) and those devoted to resynthesis (to mitigate the differences in volume, timbre or pitch on both sides of loop points). The results are somewhat variable: even though a sound may be relatively well treated (without modulation), any associated effects are inaudible. However, whenever there’s chorus, phaser or harmonically rich content with many fluctuations, the result becomes too different from the original. Another addition is Change Pitch (Variable). If you like Varispeed or turntable effects then this tool is for you. It’s adjustable via an envelope. You can: specify whether the material contains transients, save presets, and load them. Basically, it’s a handy tool that probably won’t replace Pitch'n Time Pro, but as far as quality goes, has nothing to be ashamed of. A useful feature for composing or doing sound design is Convolve, which lets you apply the spectral content of one file to another. Peak 6 now adds an envelope in the process, which lets you apply convolution only in desired places (Nice!). Another improvement in connection with convolution, is the one made on ImpulseVerb, Peak’s convolution reverb: you can use the contents of the Clipboard (not more than 524,287 samples) as a convolution source. But be careful with the Preview function which is a bit sensitive, like most of them. ImpulseVerb is, however, an additional tool available to sound designers, an open door to many creative impulses. Another plus. Last but not least, the implementation of new dithering technology, DCAT (Dither Cloning Audio Technology), which adds 12 modes (!) to the six algorithms (by POW-r) and forms of truncation. Suddenly, you’ll feel a little overwhelmed by all the possibilities, not knowing which one to choose. A preview function is included, but there should be a multiple file comparison feature for each algorithm, even quiet passages should be boosted so we can actually hear how the algorithms sound. But till then, dithering will be on a case by case basis, and comparing the results on a given file. Also note the plugin envelopes, ideal for varying the rate/level of an effect over time (like using automation), and bounce in real time, finally. As for Vbox, it’s now in version 3. It will really come in to its own on a new machine, since you can "build", within this host (limited to Peak), sumptuous multi-effects by picking and choosing from the best of third party effects. In addition to its roles as an editor and a sound design tool, Peak is also well equipped for video editing, playlist preparation, and burning CDs. Almost anything is possible: non-destructive editing, crossfades, inserting plugins, management of metadata, etc.. When creating a Playlist, you’re given the choice between Album/Song, Classical/Take or default modes, which determines the type of Crossfade, Overlap/Gap or Centered (this can be changed during the operation). The first mode is used when creating master CDs, when files should overlap or be custom gapped. The second is dedicated to assembling different takes to produce a single file (for example). Crossfade is made around a central point, locked to the timeline, and it will be the beginnings and ends of the files that are shortened when you move the cursor. You can fine-tune fade curves by inserting points, and also do the same on a whole file, with volume envelopes. Its utility is only theoretical in master mode, since songs will more than likely be mixed already, and you’ll probably just adjust the volume (gain) available in the List View. However, in Take-mode, the envelopes are very handy to create precision voiceovers, for example, or a dynamic mix of two files when doing sound design. As for crossfades, you can save multiple versions of the work in progress for comparison purposes with Snapshots A, B, C and D (very practical). The CD-TEXT features are comprehensive: by full audio CD and/or title, featuring ASCII characters, export DDP, etc. .. As for DDP 2.0 (Disc Description Protocol), which is becoming one of the main formats of commercial replication facilities, Peak manages it perfectly, with the optional extension provided in the Peak Pro XT 6 package (note that the purchase of the Peak Pro version now includes this extension bonus). The new direct export to iTunes will delight podcast fans. Peak lets you, in addition to conventional AIFF, Wave, SD II, edit files in MP2, MP3, MP4 (AAC), Flac, image Jam, QuickTime, Raw, System 7, Sonic AIFF, AU and Paris. BIAS delivers an editor that’s very complete, plus a sound and software suite that’s just as comprehensive, which explains its price. It’s true that we’ve become used to getting more for our money with the likes of Apple's Logic Suite for example, but we must not forget that this is far from the norm ... Plus you have to take into account the loops and effects (excellent quality), the various included plugins which perfectly fulfill their role (starting with native Peak plugins), EQ with different Freq versions, Sqweez compressor, multiband compressor Sqweez-5, and Reveal, all of which are very well designed. There’s not enough space here to talk about them, but they deserve their own test. In short, Peak is still unavoidable, even essential to any Mac users treating many music files in any format, or wishing to prepare playlists regularly, regardless of their destinations. 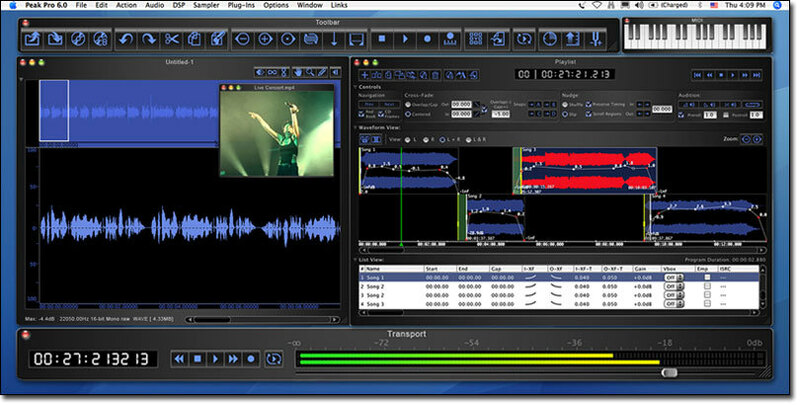 If the XT version seems too expensive, the Pro version offers a comprehensive editor, without the Master Perfection Suite and SoundSoap Pro.